It’s been a few days since my last Brexit post. Things seemed to calm down a bit on Friday, the day after the Gove power move. The weather was nice. A double rainbow appeared here in London. We think. Conservative leadership contender Liam Fox today demanded “Brexit for grown-ups” as he blasted colleagues Boris Johnson and Michael Gove for their “Oxford Union politics”. For a while this made me imagine Brexit as a modular kids’ toy system like Lego or Sticklebrix or Mega Blox. Up until now we had only been mucking around with the clunky Duplo version of Brexit, trying in vain to use its bulky, garish bricks to build a functioning economy and political system. In Liam Fox’s mind the problem wasn’t that we had Brexit at all: it was that we had the wrong type of Brexit and had to swap it for Brexit Technics or, even better, Brexit Mindstorms. No-one cares what Liam Fox thinks now, though. He’s since withdrawn from the Tory leadership race after coming last in the vote among Conservative MPs. I guess we didn’t need Brexit for grown-ups after all—we’re having more than enough trouble with the baby version. For example, Stephen Coltrane wrote a numbered series of tweets (a now-notorious trait of Brexit Britain) that outlined what might happen if Britain has to trade with the EU under WTO rules. Click the date below to read the whole thing. Another thing that happened on Friday was that the era of austerity came to an end. 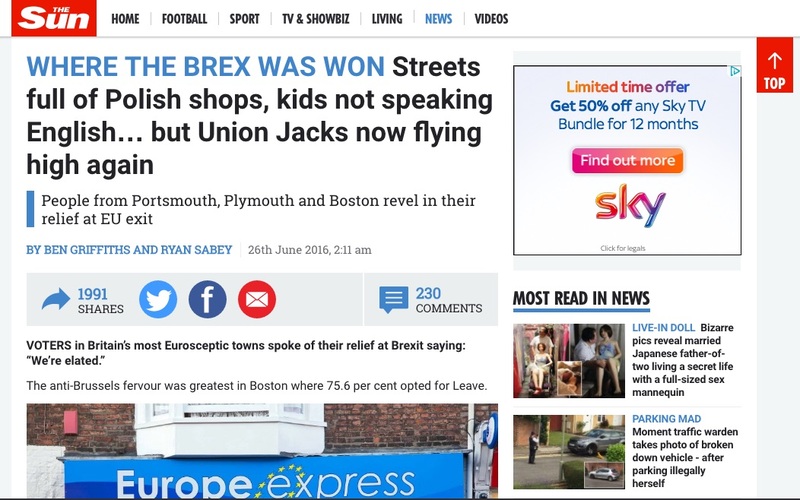 If that had happened two weeks or a year ago it would have dominated the news cycle for weeks, but in the context of Brexit hardly anyone noticed. On Saturday I went to the anti-Brexit march although I wasn’t there for long. My son, who’s four, feigned interest in the whole thing but was impatient to move on to the London Aquarium, the next item on our itinerary. It’s obligatory whenever you go on some march or demonstration in the UK to speak about it cynically – “well I doubt it’ll change anything” – but the value of the whole thing for me wasn’t based on the vain hope that Nigel Farage was going to walk by, experience a Damascene conversion upon seeing the assembled crowds, take to the podium, renounce his Euroscepticism and begin the reversal of Brexit. Instead, it was the visceral experience of seeing and being among such a large group of people who reject the insane logic and increasingly overt racism of Brexit Britain. Speaking of Nigel Farage, on Monday he resigned as leader of UKIP. Loads of people were angry at him about that—“you made this mess, you help clear it up” was the consensus view—but it struck me as a little disingenuous coming from anyone other than a UKIP member. Would I have been happier to hear he’d taken a peerage and was going to be representing the UK in trade negotiations with Europe? Of course not. The further away from public life he gets, the better. Prediction. Three months from now UKIP will be overtly neo-Fascist party campaigning on repatriation & deportation. Mind your celebrations. Douglas Carswell, the only UKIP representative in the House of Commons, provided us with perhaps the most succinct tweet ever to be posted by a politician. I wonder if Hansard has emoji support? There was a lot of scepticism about whether Farage’s resignation could be taken at face value. The world of economics continued to act in accordance with the projections set out by much-derided experts ahead of the referendum. If only more people had listened to those experts. The pound plunged to 31-year lows against the dollar. Incidentally, it did take out $1.3055. In the small hours of July 6th it went below $1.30 and is now as low as it has been since The Crowd topped the charts with “You’ll Never Walk Alone”. What’s your favourite analogy for Brexit? Mine is based on the Eminem movie 8 Mile. There’s a scene where Eminem’s mates get into a fist fight with some rivals. It’s all kicking off when suddenly Cheddar Bob, the most ramshackle and haphazard of Eminem’s friends, surprises everyone by pulling out a gun and waving it round. The fighting immediately stops and everyone’s terrified, even Cheddar Bob’s friends are terrified, because the way he’s holding it makes it absolutely clear that he doesn’t have a clue what he’s doing. I know, it’s already sounding a lot like Brexit isn’t it? At this point in the story it’s probably like Brexit around six months ago, where the squabbling Detroiters are European countries, Cheddar Bob is Cameron, and the gun is the plan to hold the Brexit referendum. Wait, though, it gets even more like Brexit. Cheddar Bob is shouted at by his own terrified friends and ordered to put the gun away. “OK, OK,” he says and, with everyone staring at him, puts the gun back into his trousers. But he’s forgotten to put the safety on, so the gun goes off and he shoots himself in the groin. Panic descends as Bob passes out from shock. The other gang runs away while Cheddar Bob’s friends bundle him into a car and off to hospital. This is where the Brexit analogy breaks down, of course—because, unlike Cheddar Bob, we have no friends. I hadn’t been in the office for long when this happened. Breaking: Gove running for leader. This tweet actually looks quite innocuous in retrospect. But it set in train the events of the rest of the day, a backstabby Game of Thrones-esque saga of treachery and betrayal in which the Conservatives put the recent Labour infighting in the shade. A text arrives from a senior Team Boris figure: "Gove is a c*** who set this up form start". This is going to be bloody. It was interesting at this point because Gove and Boris Johnson had been allies during the “successful” Leave campaign (I put “successful” in scare quotes because it’s turned out to be a pyrrhic victory) and Gove had been putting it about that he was going to support Johnson. So this announcement that he was actually standing and that Boris Johnson, what’s more, “cannot provide the leadership or build the team for the task ahead”, was tantamount to sliding a knife into your best friend’s back. The leaked email from yesterday now made sense. A couple of hours later Johnson gave a press conference at which he was expected to launch his own campaign for the Tory leadership. That isn’t what happened. All this had happened so quickly that much of the Tory press had already been mobilised in support of Boris Johnson. These newspapers had hit the shops only hours before and were now completely out of date. He has ripped the Tory party apart, he has created the greatest constitutional crisis in peacetime in my life. He has knocked billions off the value of the savings of the British people. [He’s like] “a general who marches his army to the sound of the guns and the moment he sees the battleground he abandons it… The pain of it will be felt by all of us and, if it doesn’t get resolved shortly, by a generation to come yet. This doesn’t mean that Carney messed up, of course. Pushing the exchange rate downwards can be a sensible thing to do as it helps exporters and reduces the risk of calamitous plunges later on. But it is still a sign that the economy is headed for recession. Incidents of racism in the wake of the EU referendum result have increased dramatically, according to the latest figures. Complaints filed to police online hate-crime reporting site True Vision have increased fivefold since last Thursday, the National Police Chiefs Council said, with 331 hate crime incidents reported to the site compared with a weekly average of 63. Theresa May, another candidate for the Tory leadership, has indicated that expelling EU nationals from the country is going to be a point for discussion in the forthcoming negotiations. Just think for a moment of what that would entail, how that would work logistically. So yes, it’s still fun here in the land of Brexit. See you tomorrow! Day 6 in the Big Brexit House. Today I was thinking about how deeply the word “Brexit” might embed itself in our culture. If I’m right and the era we’re about to live through will see a fundamental reshaping of the political and economic structure of the British isles, the word “Brexit” could insinuate itself into the structure of our future society, a linguistic fossil to be preserved for centuries or more. There will certainly be history and politics textbooks—hefty ones—called “Brexit”. Economists in the future will build their careers on Brexit studies. Maybe there will be Brexit Street, Brexit Avenue, the Brexit Centre. Maybe Brexit will begin to crop up in the names of babies. You can imagine it being abbreviated to Brex, Brexie, the Brexler. Actually those sound like better names for a dog than for a child. I bet there are already dogs called Brexit. The first was from Ben Judah, a journalist at Politico. Click on the date in the tweet below to view the full thing. The gist of it is that the EU, led by France and Germany, would be prepared to let the UK have its cherished controls on immigration if in return it gives up the City, causing an exodus of the financial sector from London to Paris. The deal would go down well with Brexit as it would look like one in the eye for bankers while also reducing the number of immigrants; in fact it would go down so well that the government would have little choice but to take it. The downside? A massive loss of tax revenue. So all in all it would be a huge win for France and Germany and not so much for the UK. The second Twitter thread came later in the day and was from Alex White at the Economist Intelligence Unit who summarised the EIU’s current thinking on the implications of Brexit. Again, click on the date to read the whole thing. It’s a very gloomy prognosis for the next 4 or 5 years. I’ve taken a screenshot of the whole thing so we can check back in 2019 or so and see how accurate it all was. This was being shared pretty widely but not with a great deal of enthusiasm. Read it and you’ll see why. If you do look at that thread you might see people replying to it saying “Well the FTSE 100 is up! So you’re wrong!”. I’m sorry to be boring but I want to rebut that whole argument now as I’m tired of seeing economic illiteracy exploited for political ends. The companies that make up the FTSE 100 are all global corporations whose businesses are spread across the world. Some of them will be hit somewhat by a recession in Britain as it’s a big economy, but the effect on them isn’t as big as you think it might be. In the jargon, you could say their “exposure” to the British economy is quite low even for the ones that are headquartered in Britain. So to see the FTSE 100 as an indicator of the UK economy’s future health is to misunderstand what it actually represents. This particular index only tracks companies whose sales come predominantly from within the UK, and the picture is pretty clear. That is the chart you should be looking at if you want to see what the markets think about the future of the British economy. Ignore Louise Mensch and her Yahoo! Finance screenshots. Enough financial stuff for the day. Here’s a Pokémon GIF! It’s funny, right? You know what else is funny? Inadvertently leaked emails. Remember, these are the people who will soon be running the country as it faces its gravest challenges since the Second World War. At least with the Tories you know it’s Paul Dacre and Rupert Murdoch who choose the leader. With Labour things aren’t quite as clear-cut. Today Jeremy Corbyn is sticking to his guns despite having lost the support of the vast majority of Labour MPs. He has the backing of a large number of members so can only be unseated by something akin to a party coup, which is what is being attempted. But remember, this is the age of Brexit, and so the coup attempt itself is—like everything else—a cavalcade of ineptitude. And this is despite it having been in the planning stage for quite some time. My friend's kids, who are black and British, had "so long, farewell" sung to them all day at school yesterday. I want my country back. And is this going to be what I write about tomorrow? Before getting into the day’s events I’d like to draw your attention to a column of Boris Johnson’s that was published on May 23rd, exactly a month before the vote. And was the word “Brexit” set in Comic Sans? Despite the superficial similarities, Boris is clearly no Biff Tannen and the time-travelling textbook he discovered isn’t proving a very useful guide to the future so far. Yields on British government bonds are low. Each of these—and therefore the broader claim, that everything is awesome—can be rebutted but it would be too boring to go into here. Maybe another day. I’ll just leave this here for now. In the morning, an event of historical import took place in which British dignity and gravitas was demonstrated to the full. Yes, it was Nigel Farage’s address to the European Parliament. The person facepalming in the background is a cardiac surgeon who was raised in a gulag, so it’s safe to say that he was never going to be an ally of Farage. Martin Schulz tells MEPs to stop booing Farage: "Ladies and gentlemen, I understand you're emotional, but you're acting like Ukip"
Guy Verhofstadt to Farage: "Let's look on the bright side. Finally we're getting rid of the biggest waste of the EU budget: your salary"
Although our national hero did have one fan: Marine Le Pen, of France’s neo-Nazi National Front. Good look, Britain. Shortly afterwards a very different side of Britain was on display, when Alyn Smith of the SNP gave a genuinely historic speech for which he received a standing ovation. Remember this: Scotland, did not let you down. Please, I beg you, chers collègues, do not let Scotland down now. Have I mentioned that I’m Scottish? OK, enough nice things: on to the racism. I’ve been at pains to mention in these updates that the rise in racist abuse has only been anecdotal so far, but the first official confirmations have started to come in now with the National Police Chiefs’ Council revealing that hate crimes rose by 57% week-on-week in the period immediately following the referendum. I also quoted the BBC’s Sima Kotecha’s tweet yesterday in which she said she was called a P**i in her home town for the first time since the 1980s. I found out today that that home town is Basingstoke, where I used to live. Well done Basingstoke. And a big story yesterday involved a video of a racist incident on a tram in Manchester. The video’s been taken down now because the culprits have been arrested and it’s presumably going to trial. Don’t chat s**t when you’re not even from England, you little f**king immigrant. Get off the f**king tram now. Get back to Africa. Was this in Boris Johnson’s future textbook? For me, Brexit is a bit like going through the breakup of a relationship or a bereavement in the specific sense that, when I wake up in the morning, there’s a brief period—a couple of seconds maybe—when I’ve yet to remember that all this has happened. Then the memories come in and there we go: I’m back in the room, back in the Brexit room where the chintzy carpets stink of stale beer while Farage grins at me over a Hamlet cigar. Not a nice feeling. The last thing I’m going to talk about today is what’s going on in the main political parties. They are both in meltdown but Labour is doing a much more spectacular job of it. A no confidence vote in Jeremy Corbyn yesterday delivered a gobsmacking result, with 172 MPs voting against him and only 40 in favour. He isn’t resigning though and is marshalling his supporters among the party membership. The Labour party in its current form will not survive this. On the Conservative side, it’s hard to know what’s going on really. Boris Johnson’s column on Monday (which I said at the time sounded “too good to be true”) turned out to be, essentially, a load of nonsense. Are you looking forward to this man being Prime Minister? Welcome to my second dispatch from the land of Brexit. Today we saw an attempt to get back to politics as usual with senior Conservative politicians emerging from the bunkers they’d been in over the weekend. Following on from Boris Johnson’s Telegraph article (which I mentioned last night) George Osborne gave a statement at 7am with the intention of calming the markets—“Britain is open for business”—but nevertheless the pound dropped sharply against the dollar soon afterwards, possibly prompted by Boris Johnson’s comments that it was “stable”. Around the same time, the share prices of two large British banks, Barclays and RBS, lurched downwards so sharply that trading was temporarily suspended. Perhaps Osborne’s speech hadn’t had the desired effect after all. 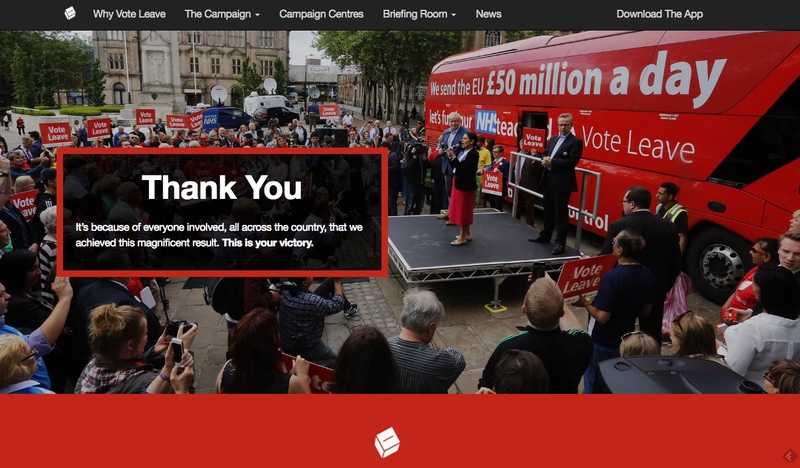 The Vote Leave campaign switched its own website into victory mode, unveiling a picture of a bus which claimed that Britain gave the EU £50m per day. Some people initially mistook this bus for its more famous sibling which had spent the campaign advancing the claim that the EU cost the UK £350m per week. And then, noticing that the number was different, some suspected that yet another Leave lie had been uncovered.
.@vote_leave @JamieRoss7 why does the image of the bus on https://t.co/gWYTilM8uA now say 50 million, instead of 350 million? Just as Twitter began to convulse with rage, someone remembered that days and weeks are different units of time. My tweet about that fella's bus was wrong. It said £50 million a day, which does equate to £350 million a week. Sorry about that! Still, it doesn’t matter as the whole thing is nonsense anyway. People who’d failed to fully understand the economic arguments of shiny red buses weren’t the only apologetic ones today. Kelvin McKenzie, the former editor of the Sun, expressed “buyer’s remorse” for having voted Leave. Project Fear now wholly-owned subsidiary of pro-Remain media. Seem almost desperate for Leave to fail. Gloomy spin on everything. Those looking for a non-gloomy spin on things would be best advised to avoid any conversations about race relations, which continued to add an undercurrent of genuine horror. This person is a BBC newsreader and reporter for the Radio 4 Today programme. And if you don’t trust people who work for the BBC then what about people who work for Murdoch-owned Sky? Presumably they’ll tell it like it is and assure us that there’s no problem with racism here. This weekend I and my family have witnessed 3 "when are you going home?" Racist incidents aimed at EU citizens here. Again, it’s too early to know for sure if there has been a surge in racist abuse post-referendum, but the anecdotal evidence does not look good. And it’s worth watching this clip from Dan Hannan’s appearance on Newsnight last Friday for another example of this. Yet another national humiliation as England lost 2-1 to Iceland. At least this one was pure comedy though. Remember when the UK and England weren't a global embarrassment? I miss a week ago. I know I haven’t really touched on what’s happening in the Labour party today but as you can imagine it’s a complete mess. Stay tuned, because it’s a fair bet that more things will be happening tomorrow.